Several months ago I was indulging in my Saturday morning tradition of watching hour upon hour of Food Network. On that morning's episode of Barefoot Contessa, it seems Jeffrey had it in his head that he wanted a boat. Well Ina was having none of it. There they sat on a park bench overlooking the marina, eating BLT's with avocado, while Jeffery, mouth full, pointed out various boats they he might enjoy. Ina laughed her "there's no way in hell that's going to happen" laugh, reminding him that she gets seasick, adding that all the boats he wanted would require an expansive crew. Perhaps he thought that the wife with the TV series, cookbook deal, magazine column and line of products might pay for it. Not likely. To make up for it, Ina fixed Jeffery this meal of sauteed scallops with a simple sauce of shallots, garlic, butter and white wine. Now this almost never happens when I watch Food Network, but for whatever reason, I was compelled to make that dish. Immediately. I ran out, picked up some scallops, a couple shallots and some lemons. Everything else I had on hand. That night I made the meal that put Jeffery's boat lust to rest and it was fantastic. As I do, I took pictures of it all, however when I uploaded them to my laptop, I was jarred by how such a flavorful, simple and delicious meal came across on film. The final shot of the dish looked like a mess. There in a shallow bowl was a haphazard pile of rice specked with slivers of green. On top of that were the scallops. Then the sauce, acting almost as a camouflage, glazed each scallops, rendering them practically invisible against the rice. "There is no way I can print these pictures," I thought to myself. I decided to put this dish in my back pocket, determined that one day I would make it again and this time plate it in a way that made it look as good as it tasted. Hopefully. First, get the rice going. Combine the rice, 1 3/4 cups water, the salt, and butter in a small heavy-bottomed saucepan. Bring to a boil over high heat; reduce the heat to low, stir once, and simmer, covered tightly, for 15 minutes. Turn off the heat and allow the rice to sit covered for 5 minutes. Add the parsley, dill, scallions, and pepper. Fluff with a fork, and serve warm. 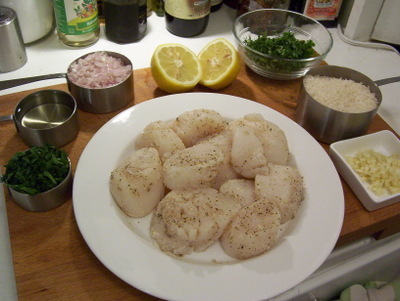 While the rice is cooking, sprinkle the scallops with salt and pepper, toss with flour, and shake off the excess. To get a really nice sear on scallops they cannot be wet. 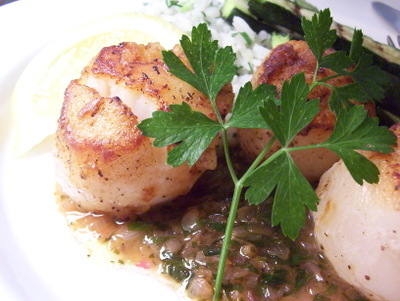 The flour dries the scallops and will help give it a nice brown color when they are sauteed. In a very large saute pan, heat 2 tablespoons of the butter over high heat until sizzling and add the scallops in 1 layer, making sure they are not touching. Lower the heat to medium and allow the scallops to brown lightly on 1 side without moving them, then turn and brown lightly on the other side. This should take 3 to 4 minutes, total. 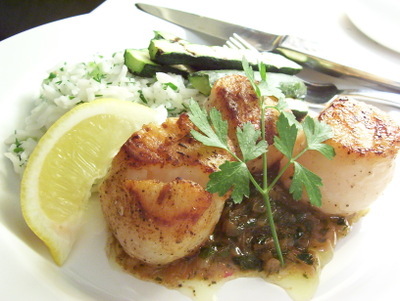 Once the scallops have seared, remove them from the pan and place on a plate and cover with aluminum foil. Melt the rest of the butter in the pan with the scallops, then add the shallots, garlic, and parsley and saute for 2 more minutes, until the shallots have softened. Pour in any of the juices that the scallops have given off while resting into the saute pan and then add the wine and the juice of one lemon. Tturn up the heat to high and cook until the sauce has thickened to your liking, while scraping up any brown bits on the bottom of the pan. This should take a minute or two. At this point you could add the scallops back to the pan and stir to coat them with the sauce. However, I like the slightly crisp texture of the sear on the outside of the scallop and I find that combining them with the sauce in the pan makes the scallops taste soggy. To serve, spoon a mound of the herbed basmati rice onto a plate. Beside it spoon some of the shallot white wine sauce and then place three scallops on top of the pool of sauce. Garnish with a little more parsley and serve with a wedge of lemon. I also served the dish with some simple grilled baby zucchini. This is a really quick and easy dish that could be thrown together on a weeknight in less than thirty minutes although it also has the kind of refined flavors that would make it a good candidate for small gathering with friends. I say small because, this is the kind of dish that is best when served right away and unless you have two saute pans, you can really only cook enough scallops for four people at once. How much do I love scallops? These had a really nice, delicate crust on the outside and were sweet and tender inside with a beautiful pearly opaque color. The shallot white wine sauce is rich and buttery, always great with seafood, but also has a herby freshness and a little tang from the wine and lemon. You could bring this out further by adding a tablespoon of briny capers to the sauce when you add the wine. In fact I might do that next time. The addition of fresh herbs to the rice jazzes it up nicely and gives the dish, which has a buttery richness, a vibrant, clean undertone. I was lucky enough to taste these scallops and hands down -- they were the most mouthwatering scallops I have ever had -- I begged Grant to open a restaurant for the sole purpose of serving these. Del-ic-ious. where do you buy the scallops? whole foods? I get nervous buying seafood since I grew up in a non-shellfish house and not sure what to look for. these look amazing. Scallops are my go-to when I'm tired and don't feel like cooking. I just pick up a few on the way home and whip 'em up with whatever I have on-hand in the fridge. They're so versatile that way. This dish looks delicious! I love scallops and am dying to give this a try. It must be quite a recipe if it distracted a man from getting a boat! My husband and I are obsessed with Ina. We even made up a drinking game. Drink every time Ina asks a rhetorical question (e.g. "how bad can that be? "), every time Jeffrey has to work; every time Ina cracks an egg into a bowl because you never know when you're going to get a bad egg, etc. etc. Very intoxicating. I love shrimp. I love scallops....and I have to add one more....I love lobster. Thanks so much - I'm planning on trying them now! Seriously, it took all of 30 minutes prep, and tasted like it took all day. A true "weeknight gourmet" item. I'm a somewhat experienced cook, and I usually adjust recipes based on my own taste and experience, but I made this one exactly as you wrote - and I wouldn't change a thing. Just perfect! Thank you so much for posting this one! Many have tried and failed to stimulate isomeric isotopes into emitting high energy photons enough to serve as a gain medium and produce a coherent gamma ray beam that might serve as a laser for purposes civil and military. Princeton's Richard Wheeler surfaced the idea of matter-antimatter annihilation in positronium serving this purpose decades ago, but only now have electron-positron molecules been observed to condense into quantum states of technological use in applications as diverse as space propulsion and medicine.